Whereas the Old GM only updated vehicles during an official refresh period and reserved the best technology for high-end brands (read: Cadillac), the New General Motors has a completely different mindset. It seems that New GM puts its best technology into all and all new models, constantly updating vehicles with new features. Take, for example, the new Buick LaCrosse. Having been on the market for just under a year, the LaCrosse has already received one very important revision with the addition of the 2.4L Ecotec. This coincided with the discontinuation of the 3.0L V6, leaving the LaCrosse buyer with a choice of either the base 2.4L or the high-feature 3.6L – a move that makes perfect sense (as discussed here). 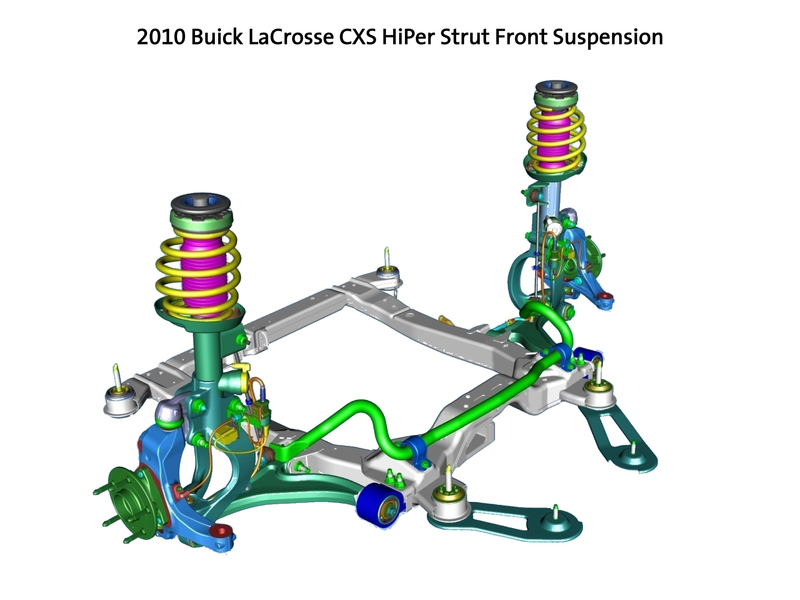 But the folks at Buick weren’t content to step there and are making further revisions to the LaCrosse with a technology called HiPer Strut. 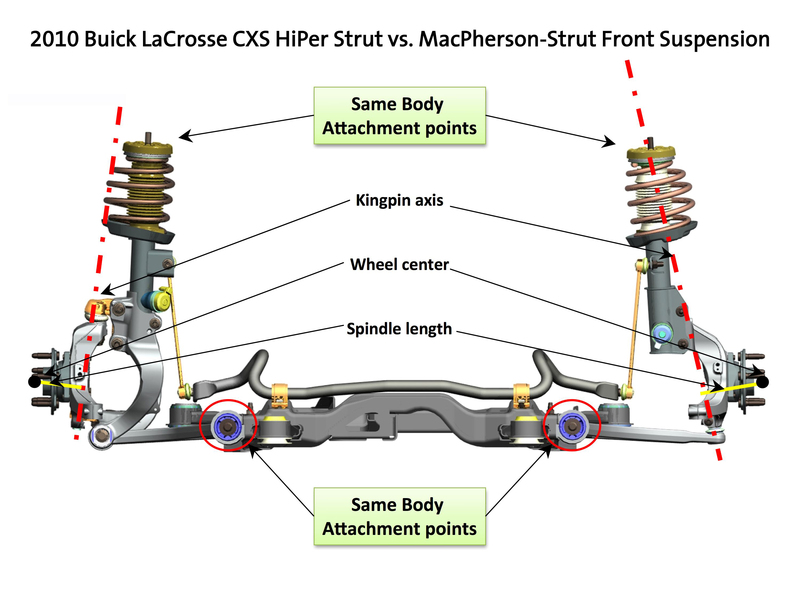 An acronym for high-performance, HiPer is an innovative, unique front suspension design that utilizes premium, technologically advanced engineering to improve ride, handling, and steering in the front-wheel drive LaCrosse. The design reduces torque steer, boosts vehicle response to tire variation and imbalanced wheels, and provides more linear steering – all while enhancing communication by improving camber control. HiPer also improves on isolating impact from bumps and rough surfaces. Whereas conventional dampers are used when the HiPer struts are paired with the standard 18-inch wheels, the LaCrosse also gets technologically advanced, electronically controlled dampers with optional 19-inch wheels. HiPer Strut is based on the MacPherson strut front suspension, utilizing dual-path top mountings. This type of top mounting separates the transfer of damper and spring loads from the body. The steering knuckle/strut carrier is combined and is unique to this improved design while the suspension uses a rigid sub-frame that attach to the lower control arms. The sub-frame is bolted to the body with four isolators that reduce the transmission of noise and vibration to the vehicle body. In effect, this design enables a limited-slip differential that provides superior grip, traction, and ride quality, especially when combined with larger diameter wheels such as the optional 19-inchers on the CXS. GM describes the significance of the system as “what you don’t feel.” The absence of torque steer and sharp reactions to bumps and potholes is important in providing a more linear and controlled driving experience. 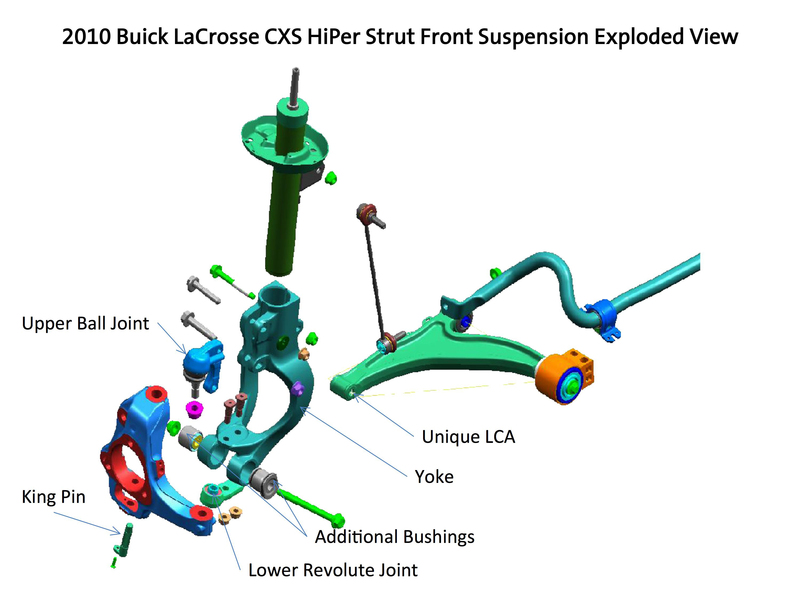 The LaCrosse CX and CXL will continue to use the traditional MacPherson strut front design and all three models (CX, CXL, and CXS) will use a four-link rear suspension when equipped with 18-inch wheels. When the CXS is equipped with 19-inch wheels and the touring package, it features a more advanced H-arm configuration and a cross member attached via isolated mounts, resulting in less noise and greater ride quality. The Touring package also includes electronically controlled, variable dampers that constantly “read” the road and vary damper rates based on those conditions. Electronic Brake Force Distribution with Break Assist, which provides the wheels with the most traction the greatest amount of braking power while applying additional breaking power when the system senses emergency stopping. The new LaCrosse has been a very strong seller for The General and for Buick during the first year of its life cycle. In fact, if it weren’t for the new LaCrosse, Buick sales would be in the proverbial gutter at this point in time. The aforementioned improvements should only add to the success of Buick’s new sedan and give it a leg up against stalwart class leaders such as the Lexus ES. In the end, we’re glad to see this amount of innovation and importance placed on a key GM product. Most importantly, these modifications are perfect examples of the New GM and its change in organizational culture to make constant improvements to vehicles, as opposed to holding back updates for a refresh or redesign. Overall, I am very pleased with my 2011 CXS (18″ wheels) now with 600 miles. In test drives at low speeds prior to purchase, I found the ride smoother and quieter than the 19″ version with the touring package. However, I am picking up a MINOR steering wheel vibration at above 55- 60 mph up to at least 80 mph. My dealer looked at it today and says the wheel balance os OK but on checking with GM this is a known issue of a harmonic vibration. GM is reportedly working on a fix. Yes, this is very interesting. Overall, I would expect the 19s to much louder than the 18s and also result in a more firm/stiff ride. But they shouldn’t result in the vibration issue. Let us know how it goes! Interesting! And good to know, maybe we’ll see some kind of recall or TSB for these cars in the future. Thanks for informing us, we always appreciate this kind of information. I think is a better design, we only have the 2010 CXS version avealeable with 18´´ wheels. I have a 2010 cxs and it has been to the dealer 6 times for a vibration in the steering wheel. dealer told me the to rear tires were defective..after purchasing new tires vibration is still there. dealer says they can not figure it out. i love this car but hate driving it.